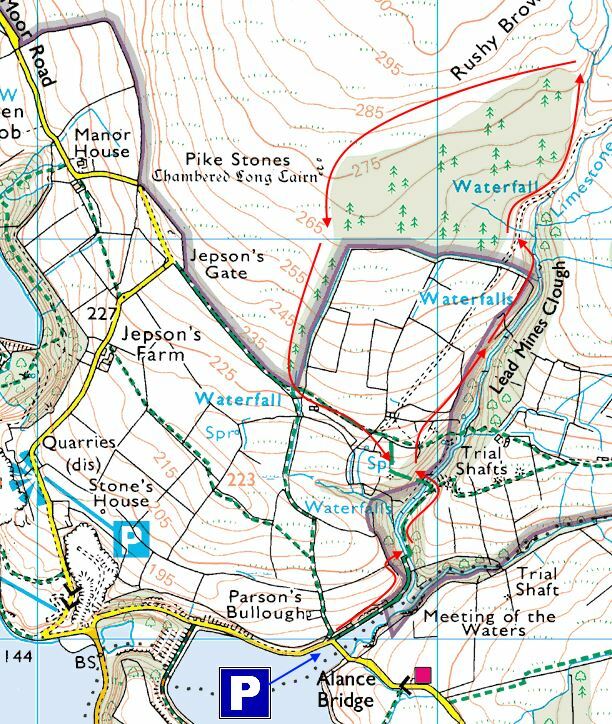 This is a great walk at any time of year, taking in the Wellington Bomber memorial and from there using an unmarked but very useful path to take us along the higher reaches of the valley. Park at Alance Bridge for this pleasant stroll. There’s normally a few parking spaces by Alance Bridge. This is a replacement for an old bridge of the same name, that crossed the River Yarrow here before the creation of the reservoir. Take the footpath straight ahead that runs alongside the river, along the well-made track that shows evidence of quarrying and old stonework. You will cross a small bridge over the river here, notice how the river bed has been cobbled beneath you. You are now in Lead Mines Clough, a very historical area, which is well worth half an hour’s exploration on it’s own. As you walk alongside the river, you will come to another footbridge. Cross here, and then take a right through the kissing gate, but instead of walking alongside the river, head straight up between the trees. This is a short, steep climb to the Wellington Bomber Memorial, and a great viewpoint. From here, you need to find the unmarked path. It runs straight ahead in a continuation of the direction that you have been travelling, towards the fieldline. Don’t cross into the field, instead, carry on this path which runs parallel to the river below. You have nice views through sloping woodland on your right, and open farmland on your left. Continue along here for some way, until you reach a kissing gate that puts you onto a decent farm track. You can bale out here if you like, turning left to go through the field which takes you past the ruins of Fogg’s and back to Alance Bridge. Instead, I suggest carrying on by turning right instead, and continuing to walk parallel to the river. You will come to a clearing where you have the choice of crossing the river once more if you like, and you can get down to the waterfall here if you are feeling brave. We won’t cross the river, instead, we will keep going straight on until the river forks. Here, turn left and walk around the edge of the plantation all the way past Pikestones and across rough moorland tracks until you join another decent farm track. Join this track and head left, until you return to the top of Lead Mines Clough, where you can retrace your steps from the earlier part of this walk.